In October 1969, aspiring draughtsman Birkin Haward joined of Foster Associates, then located in the London suburb of Hampsted. Over the following fourteen years, while working on several of their most celebrated buildings, he witnessed the firm´s growth in size and reputation, to become an internationally acknowledged leader in contemporary architecture. 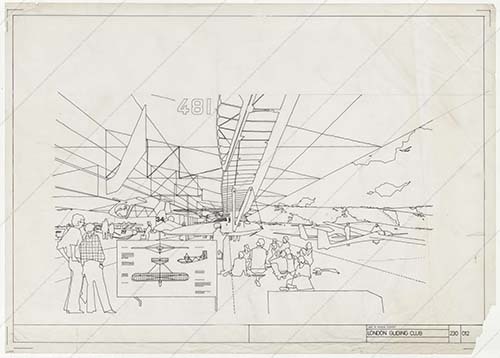 In 2018, the Norman Foster Foundation was delighted to welcome him into its Archive to discuss the projects he worked on, the practice itself, and how his drawings were produced in a uniquely creative environment. On joining the practice, Haward first worked on dockworker facilities on London’s Isle of Dogs. The client was Fred Olsen, who brought a refreshing impetus to the design. The resulting amenity centre introduced unprecedented high-standard facilities to a then neglected sector. The two-storey interior, where workers and clerical staff shared spaces, marked a radical departure in planning and improved social and industrial relations. Overshadowed by warehouses, the elevation was a wall of mirrored glass. This was an unprecedented feature on industrial amenity provisions, signalling the arrival of new materials and construction methods. The centre’s success was due to a comprehensive understanding of the client’s requirements. This was also true of the Passenger Terminal which enabled passengers to avoid navigating the quayside. The Terminal’s baggage handling system was a customised solution made from agricultural machinery, contained within the narrow available space. Interiors were given a sense of direction by the two ends being clear glazed, thereby opening vitas onto the surrounding docklands. Successful collaboration with Olsen led to an innovative, ecologically sensitive planning study for the Canary Island of La Gomera. “It was the first time the office had been involved in something of that scale”, Haward recalled. La Gomera had resisted the encroachments of a burgeoning package-holiday industry, and the climate restricted agriculture to valleys on the island´s north side. To counter the intrusive urbanization found elsewhere, this planning study examined the island holistically, devising an integrated model for tourist and urban development. New facilities reflected the island’s vernacular idiom, balanced by harnessing readily-available natural energy sources to provide electricity and desalination for residential and agricultural purposes. Foster’s interest in aviation was reflected in a scheme for the London Gliding Club. Based at Dunstable Downs the original hanger opened in 1936, but subsequent development marred the site. The practice’s proposal would unify the separate parts under a lightweight overhang with a continuous apex skylight. The storage hanger permits the gliders to be stacked flexibly. To minimize on-site construction, the building was designed of prefabricated components. 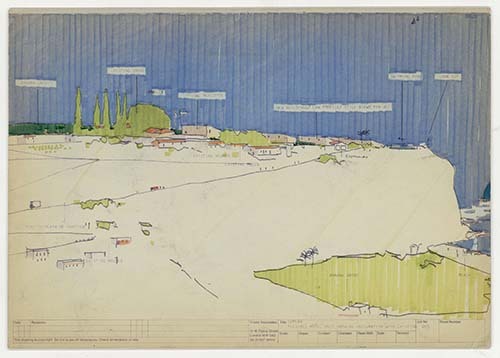 The spontaneous draughtsmanship conveys the enthusiasm for this project, which regrettably was never realized. Haward also worked on The Sainsbury Centre, a building which redefined museum display space. The informal presentation of the Sainsbury’s collection was achieved through minimal means. Integrated provisions responded to the flexibility needed for changing displays, and the variety of objects in the collection. The result has a unity of intent and expression throughout: there was no “distinction between interior designer and architecture”. Significantly, this project generated a specific type of drawing, which clarified the components and structure, proving a valuable part of the design process. 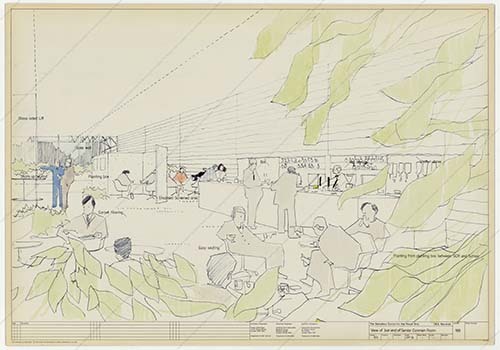 Through this project Haward recalled how drawing became an “office language”, with different techniques employed for different drawings. Drawing came out of discussions among colleagues, in a constructive environment utterly unlike conventional architects’ offices: “a completely different way of going about things”. 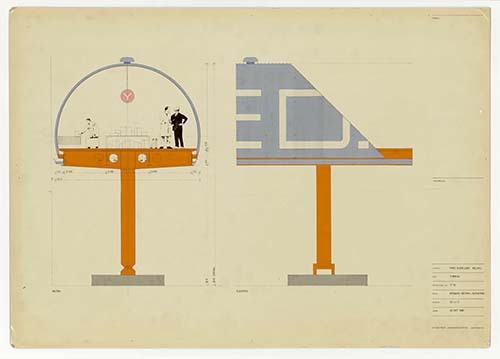 Specific drawings conveyed how the building was intended to function, how component parts related to one another, and which alternative proposals were possible. The Inside the Archive interview with Birkin Haward can be viewed here.